A view of the Nifty Fifty's location in Ridley Township. Leo McGlynn, owner of the restaurant chain, announced the news on Fox’s “Fox and Friends” morning show Tuesday during a live segment in New York City. “We have a franchise location that’s going to be opening at 10th and Oregon in South Philadelphia,” McGlynn told the hosts. McGlynn didn’t specify when the restaurant was slated to open. He did bring Matthew Devine, the chain’s first franchisee, to the show. McGlynn said Devine signed a deal on March 18, and also said the chain has two more franchisees set to sign deals. This won’t be the first time the chain ventured into South Philly: There was once a Nifty Fifty’s location at the corner of 10th Street and Reed Street, just a block from the Pat’s and Geno’s cheesesteak corner. That location closed up shop in the early 2000s. 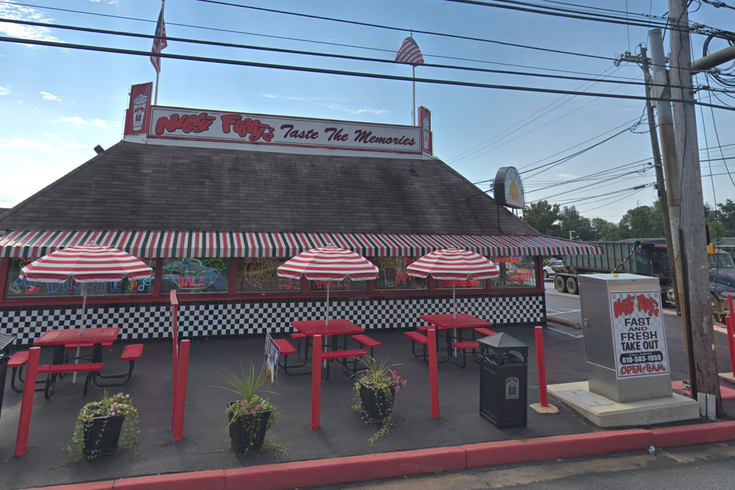 Nifty Fifty’s currently has three locations: Northeast Philadelphia, on Grant Avenue; Ridley Township, on MacDade Boulevard; and Turnersville, New Jersey, on Route 42. In 2013, McGlynn and four other co-owners of the restaurant chain received various prison sentences in a tax evasion scheme. McGlynn and his co-owners evaded $2.2 million in federal employment and personal taxes, according to the FBI’s Philadelphia Division, and McGlynn was sentenced to 36 months in prison.